When I talk to local food producers, many of them mention using the services of the Food Centre on the university campus for the initial development of their product. I was curious, so I contacted the Centre and Carmen Ly, the Communications Director, was kind enough to outline their services and give me a tour of the facility (complete with hair net, white coat and disposable slippers!). There’s a huge gap between making a great food product in your kitchen at home and starting to sell it commercially. The Saskatchewan Food Industry Development Centre was established in 1998 as a partnership between the Ministry of Agriculture, the Saskatchewan Food Processors Association and the University of Saskatchewan to provide one-stop, full-service assistance to food producers. The Food Centre provides assistance in three key areas: product development, manufacturing and processing, and food safety. Since it opened, the Centre has helped to develop about 550 products, half of which were later test marketed. In 2010, the Centre assisted 13 clients to develop new products. An additional 25 companies used the Centre’s food processing facility. Clients range from individual entrepreneurs who are just getting started, to established businesses that want to expand but require a federally-certified facility to export more widely (e.g. meat that is regulated), to a few large companies that require assistance with product development as they don’t have their own research and development department. When an entrepreneur contacts the Food Centre for the first time, you are asked to fill out a prospective client form describing your product, outlining your business and marketing plans, and describing your competitors and your labelling plans. This assists you and the Centre to evaluate whether you are ready to start developing your product or if you need to do some more research. Next, you’ll meet with a product development team to fine tune your recipe and to discuss any potential production issues. The Centre’s staff will also test your product for shelf life and food safety. If the final formulation meets your expectations, the recipe will be scaled up and you’re ready to move into production. The Centre can provide advice concerning packaging and labelling, and they can help you with the nutritional label. The Food Centre has a state-of-the-art processing facility. 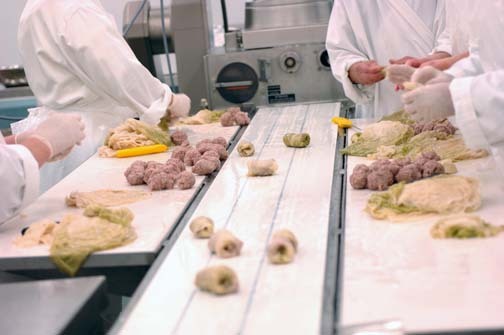 Its many certifications, including HACCP (Hazard Analysis Critical Control Points), FDA (Food and Drug Administration), CFIA (Canadian Food Inspection Agency) and organic, give processors access to worldwide markets. The facility is designed to cater to many different sectors with large kettles for making jams and sauces, two large smokers/dehydrators, a bottle-filling line, and a labelling and packaging line. The Centre provides the equipment, the facility and a technician. The client provides ingredients, labels and boxes. And you arrange to have your product picked up and shipped out. Food safety is a key part of the Centre’s operations. They provide online training and workshops, conduct on-site visits to help clients who are experiencing a problem and pre-audits for clients who are HAACP-certified to identify any critical control points that may be lacking in their operations. The Food Centre plans to expand its market through the purchase of new technologies. They have recently purchased an extruder, the first of its kind in Saskatchewan, which mixes the ingredients, cooks them, and then spits them out in many different formats (e.g. puffy round balls for cereals or snack items, long, skinny pieces for pasta or small chunks for soy-based meatless products or pet food). The Centre recently received $800,000 from the Government of Canada to purchase additional equipment. The Centre is targeting the fruit and pulse industries, so they are considering juicing and drying equipment, bar-forming machines and pouch-packaging equipment. The Centre is offering two full-day workshops in Saskatoon (April 4) and Regina (April 12) on the programs and services that are available to foster innovation in the food industry. More detailed information and the registration form are available here.